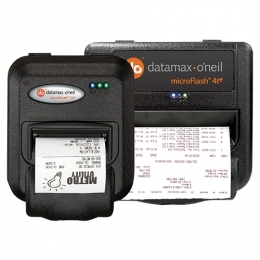 The mobile direct thermal receipt printers of the microFlash Series from Honeywell are, above all, robust. With their virtually indestructible housing they ensure for daily reliability when it comes to long-term, uninterrupted usage. This is reflected in the particularly long warranty period for mobile printers, a full 24 months The housing withstands drops and impacts without damage, and yet the printers are more compact than comparable printers. Various models offer receipt printing of media with a maximum width of 57 mm or 112 mm 2te vs. 4te. Extreme environmental temperatures are no hindrance for the microFlash mobile printers. Within a temperature range of -20 and 50C users remain confident that their printers remain reliable. Connection to any mobile device occurs easily via the serial interface, optionally also wirelessly using Bluetooth. The 4te additionally offers a secure 802.11 b/g Wi-Fi connection for more flexibility and mobility. An optional magnetic stripe reader assists users with payment applications.